The Canucks are a bottom-of-the-league team adding veteran players as if they were a playoff contender. They're just delaying the rebuild that needs to happen. THN is rolling out its 2016-17 Team Previews daily, in reverse order of 2015-16 overall finish, until the start of the season. Today, the Vancouver Canucks. -Are the Sedins destined to go down with the ship? The Canucks aren’t in rebuild mode yet – they look to be reloading still – but when that happens does that mean the Sedin twins will be peddled for picks and prospects? Henrik and Daniel will be 36 when the season opens and have two years remaining at $7 million AAV on identical pacts. If things go pear-shaped this season or next, what are the chances the Sedins waive their no-movement clauses and accept a deal to one team with a ton of cap room? That’s a slim to none proposition. –Brandon Sutter is due for some good health, isn’t he? After missing 60 games with a sports hernia and broken jaw, Sutter was dearly missed in Vancouver in terms of production (he should be good for 20 goals) and what he offers as a proven two-way center. His return to good health is a strong bet, and there should be few concerns about his fragility. He missed just three games total in the five seasons before coming to Vancouver. -Will the Canucks draft first overall for the first time ever? Since joining the NHL in 1970, the Canucks have drafted second-overall four times (Dale Tallon, Trevor Linden, Petr Nedved, Daniel Sedin) and third-overall four times (Jocelyn Guevremont, Don Lever, Dennis Ververgaert, Henrik Sedin). But they’ve never picked first. Several prognosticators peg them for 30th, which still just gives them a 20-percent shot of winning the lottery. So odds are they’ll lose the draft lottery, too. Player projections are based off a three-year version of Game Score (which you can read about here) weighted by recency and repeatability and then translated to its approximate win value (Game Score Value Added or GSVA). Team strength was derived from the combined value of every player’s GSVA on a team. The season was then simulated 10,000 times factoring in team strength, opponent strength and rest. Based on the off-season they had, it seems like the Vancouver Canucks are trying to make the playoffs. They signed Loui Eriksson to a six-year deal and traded recent first round pick Jared McCann for a prime-aged player in Erik Gudbranson. Both moves point to a team trying to reload after a disappointing season. One quick look at their roster and you start to question why. Simply put, this team just isn’t very good and they’re only delaying any future contention further by foregoing a rebuild. As presently constructed, this roster isn’t good enough to compete and the team is kidding themselves if they think otherwise. 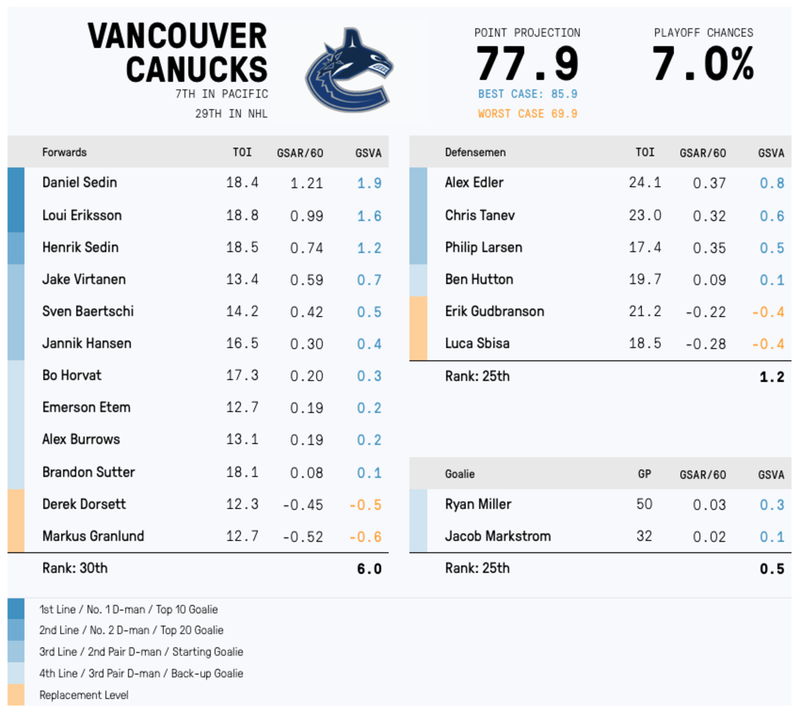 The Sedins are still very good players – although age is a concern – and Eriksson is a bonafide first line talent, but other teams boast much stronger first lines. After that things get even murkier as those three are the only legitimate top six players on the team. The next three are third liners, while the entire bottom six is composed of fourth line or replacement level talent. The Canucks are actually tied with the Devils for fewest projected top-six level forwards in the league. Being tied with New Jersey for anything revolving forward skill is usually a bad sign. What that lack of depth means is that any injury to the top line and the forward group starts looking very ugly, very quickly. Even if they manage to stay healthy, the talent is spread too thin to compete. 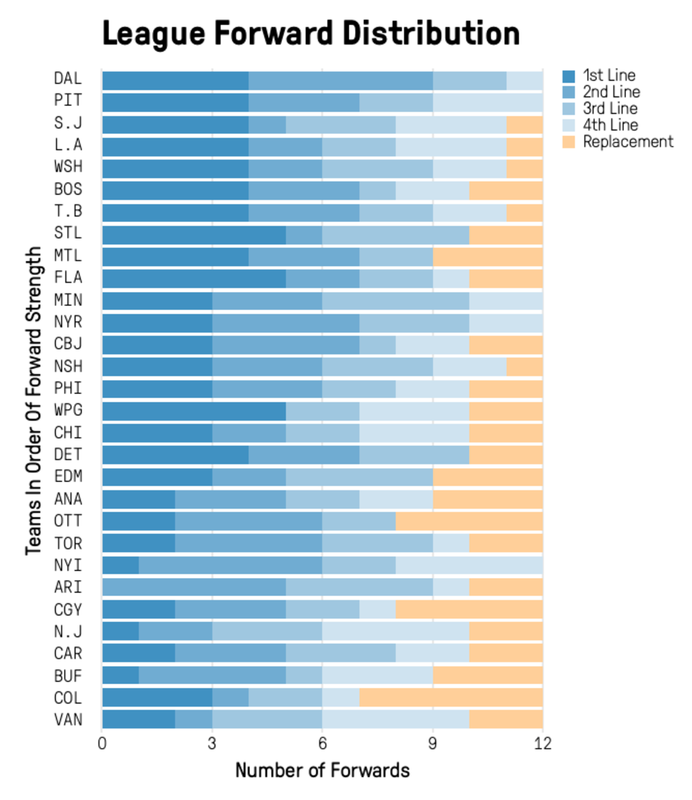 The Canucks easily have the worst forward group in the league. Things aren’t much better on defense. Again, the top is fine with Alex Edler and Chris Tanev, but the bottom four is incredibly uninspiring. In net, Ryan Miller isn’t the same goalie he once was and Jacob Markstrom hasn’t panned out to the goalie many expected him to be. What that leaves is a very flawed roster, one that’s more likely to compete for the best lottery odds than with the best teams in April.